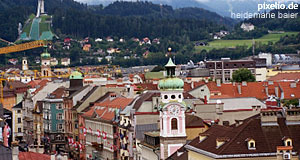 Innsbruck is the capital of the province Tyrol and Austria′s fifth-biggest town. The city spreads along the scenic Inn Valley, whereby "Inn" is unfortunately a river. It is a top-destination for skiing holidays, however, Innsbruck itself is a charming medieval city that makes an attractive destination all year round. It is easily accessible from Salzburg by train or car. The "Hofkirche" is a good starting point for exploring the proud and self-confident city of Innsbruck. In this church you will find the tomb of Emperor Maximilian I. whose court spent a lot of time in Innsbruck. The black bronze figures flanking the tomb are called "Schwarze Mander" in the distinct Tyrolian accent, meaning "black men". The "Dom zu St. Jakob" is a Baroque cathedral with works by Lucas Cranach the Elder. It was re-built between 1717 and 1724 by Johann Jakob Herkomer and Johann Georn Fischer. Another church in Baroque style, though with Rococo elements, is the "Wiltener Basilika", built between 1751 and 1756. It is affiliated with the Stift Wilten Abbey. The Renaissance castle Schloss Ambras is located East of Innsbruck, but another top-attraction and easily accessible by tram. It was built for Ferdinand II., Duke of Tyrol. There is an English-style park around the castle and a collection of "curious items" from the 16th century. Here you can get an idea where our modern understanding of a museum is coming from. The Bergiselschanze is a ski jump arena designed by Zaha Hadid and opened in 2001. It contains a café and offers some of the most stunning views over Innsbruck and the surrounding mountains. The ultimate top-attraction of Innsbruck is the "Goldenes Dachl" or "Golden Roof" in the medieval city centre. It is a bay window with a roof built from 2657 golden tiles by Emperor Maximilian I. Another attraction is the "Alpenzoo Innsbruck" ("Alp zoo") that displays mostly animals from Central Europe and the Alps. The zoo was built in an altitude of 727 metres and prides itself for being the highest of Europe (there seems to be an obsession with superlatives in Austrian zoos - both Salzburg Zoo Hellbrunn and Vienna's zoo claim to be the oldest zoos in the World). Beyond that, try to stroll around in Innsbruck′s city centre and enjoy the over-all atmosphere. Innsbruck is a university town with a vibrant night life and a distinct local culture. It can be rather crowded in the summer months. There are several museums and smaller attractions that the local tourism office will be able to inform you about. If you want to escape from the masses and enjoy some hours in high alpine terrain, take the cable car up to the Hafelekar. In any case, even if you are not interested in hiking or skiing and focus only on the "standard" sightseeing things, Innsbruck should keep you happy for at least one or two days. You can get to Innsbruck from Salzburg easily by train. Local travel agencies in Salzburg might even offer day trips by bus.